The WideTEK® 36CL-600-MF1 forms the basis of a powerful and high quality MFP system to scan, copy and archive documents at high speed with the Canon TX-3/4000 series printers. 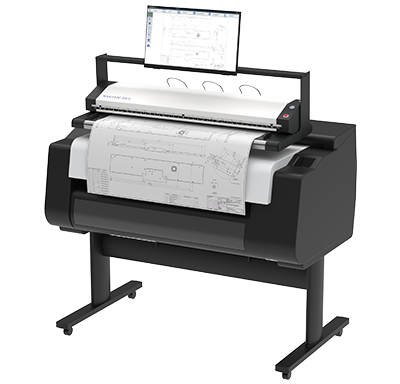 The WideTEK ® 36CL-600-MF1 mounts on top of a Canon TX3000/4000 or iPF 4000(S) wide format printer- Together with the integrated 64bit Linux-PC and the 22 inch touchscreen, the result is an economical MFP solution, featuring the best in industry scanning capabilities. The WideTEK® 36CL-600-MF1 includes the Canon TX stand, which was developed specifically for the TX series printers, to give this MFP solution the smallest footprint possible. The WideTEK® 36CL-600-MF1 also features a built-in closed loop color calibration function, producing the best possible copies for your selected printer and paper combination. Select media type, printing quality and more as well as watch the ink levels through the 100% integration of the printer´s functionality in ScanWizard. All required software option keys are factory installed, making this the simplest MFP solution to implement. The WideTEK® 36CL-600-MF1 can also be used with many imagePROGRAF PRO series printers. To see which scanner solution is best for your printer, refer to the Image Access Scanner and Printer Wheel. 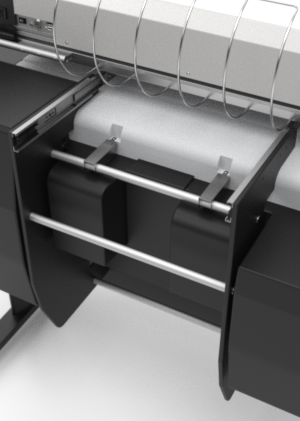 The special stand, designed specifically to neatly fit the contour of the printer, is easily and quickly attached with two screws. Assembly is easy since there are only 13 parts. No service technician required. Users can slide the scanner forward and back for access to the front of the printer, as shown in the schematic below. In its normal position, the scanner can easily be operated, and the ink tanks are fully accessible. The scanner gently slides to the back position and latches there for full access to the front cover. The scanner is operable in both positions, depending on the user´s preference. If you are planning to buy an MFP solution with a Canon TX series printer, or you want to replace an old scanner in your existing MFP system, the WideTEK® 36CL-600-MF1 solution is by far the fastest color CIS scanner on the market, running at 10 inches per second at 200 dpi in full color. At the full width of 36" and 600 dpi resolution, the scanner still runs at 1.7 inches per second. The scanning speeds are tripled in black and white and greyscale modes but can be individually configured if required for example, to scan fragile, valuable documents.